EVEN IF YOU AREN’T IN AWANA! 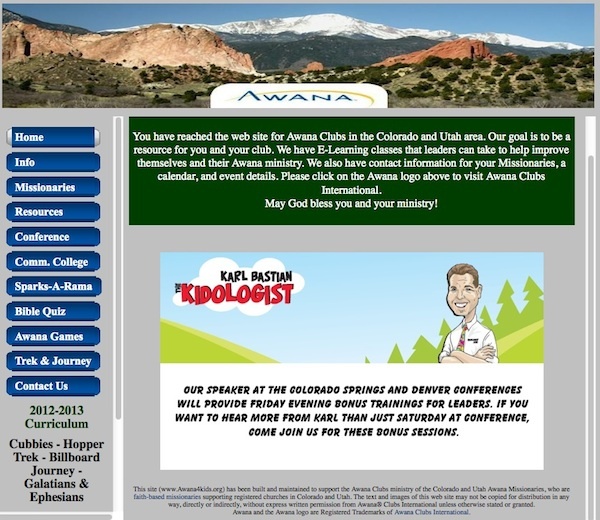 If you are in kids ministry, and if you are in Colorado, let me encourage you to JOIN ME at one of the Colorado Awana Ministry Conferences that I’ll be ministering at this fall! While there are some workshops specifically for Awana Clubs, most of the training (and all the classes I am teaching) are general Kidmin Training that will apply to ANYONE in children’s ministry! What makes a lesson memorable? Learn how kids minds and memories work – and how you can teach lessons that last not only through the week, but into their adult life and genuinely impact eternity! Kids love to learn – but they learn best through experience! Create lessons that impact kids beyond just the brain. Get them excited about their faith and walk with God. Workshop 2 – Object Lesson Explosion! Kidology is the study of kids and their world. To be an effective minister to today’s children, one must learn to do it from within the context of their culture. A working knowledge of a kid’s world is an inroad to their heart. Learn how to relate to kids and keep up with their ever-changing culture. There is a reason Jesus used stories. Life IS a story. History is “HIS Story.” Learn the secrets of how to be an amazing story teller and how to have your kids on the edge of their seats when you tell stories! You can get complete details at www.Awana4Kids.org – you don’t need to come both days, you can choose just Friday evening (I’m the only trainer) or just Saturday (Lots of workshops to choose from, myself and many others) or come for both! VISIT THE WEBSITE and click on the options to the left under CONFERENCE for INFO, REGISTRATION and WORKSHOP LIST for downloads with all the details.